Seven signature tones from guitar legend Eric Clapton. In conjunction with Eric Clapton, we have helped recreate some of his most famous tones in the DigiTech® Crossroads Artist Series pedal by applying our new Production Modeling™ technology.This revolutionary technology was designed to help reproduce the studio and live sounds and effects of an artist as heard on their recordings. This includes modeling the speaker cabinets, microphones with their placement, pre/post effects, and the recording engineer's magic all in one pedal. 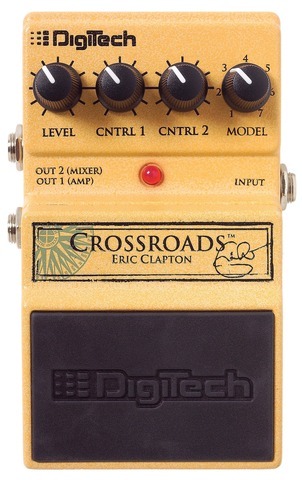 The Crossroads Artist Series pedal was conceived in conjunction with Eric Clapton and his long-time guitar tech Lee Dickson. Crossroads models seven Clapton signature tones. From songs like Badge with its swirling rotary speaker, to Layla (Unplugged) with its intimate acoustic tone, and of course, Sunshine of Your Love which features Eric's signature "woman tone", Crossroads spans 30 years of Clapton culture and tone. A portion of the proceeds from the sale of this pedal is being donated to Crossroads Centre, an International Centre of Excellence for the treatment of alcohol, drugs and other addictive disorders.